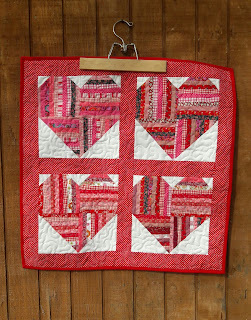 I've made several of these cute little scrappy heart wall hanging/table topper. I hang mine every year, but I've found they also make quick gifts. I have a wonderfully handy friend. Well truth be told I have several. But this in particular friend made me these really cool towel racks for my bathroom. I bought the hardware. She had the wood and know how. I love how they look in my bathroom. This pathetic picture in no way does them justice. There just isn't enough room or light to get a good picture. I hope she will be as thrilled with my handwork as I am with hers. That's a cheery take on hearts that will surely be appreciated. In my experience, people who are adept at working with their hands usually appreciate the work of others, even if they don't completely understand how the magic is done. I'm sure she will love it. It is so sweet. 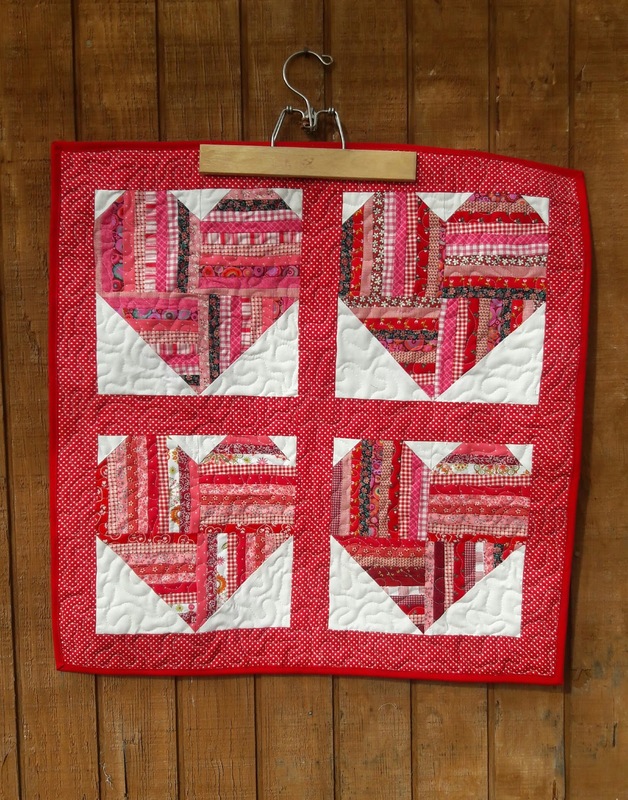 What a cute quilt - love the towel rack too! 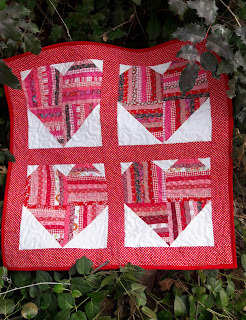 A very adorable little quilt - too sweet for sure! Your hearts are a great way to use some of those scraps that keep multiplying so easily! Adorable! I think she will love it. And I love your hanging rack.